This week really focuses on your heart and solar plexus chakras, and building strength in those areas. By focusing on self-love and a sense of accomplishment, you can get rid of any feelings of guilt and disappointment. We focus on grounding ourselves in self love, and how to bring peace into our lives without depending on outside circumstances or controlling others. You are in a perfect place right now and it is important to realize your self worth. You will recognize movement and change your perspective about your current place. You are perfect and Divine, and this reading is FULL of love for you. You will most likely begin this month frustrated. This is a reflection of your inner struggle to find, do, or accomplish something MORE than you already are. You might worry about the steps you’re taking, hypotheticals, or anything else you can possibly worry about. Don’t worry; you have what it takes to succeed, and this month you will balance your worries out with your passionate desires. The guidance here is to take slow, steady steps; energetically, through your thoughts and emotions, imagine how it would feel to bring a certain something or situation into your life. How would you integrate it into your life? If it comes all at once, it could throw you off balance, so focus instead on how you can plan for it. By the end of this month, you’ll be ready for that GO feeling, and able achieve anything. During this week, I had a dream about a reindeer. I was walking through the woods, following some train tracks that never seemed to end. It was nighttime, and it was quiet, and it was snowing. From out of the forest came a reindeer, who allowed me to pet him. I asked him his name (“Roger,” he said) and then I awoke. I mention this here because reindeer have a symbolistic meaning that fit into the theme of the energy of December that applies to all of us. Reindeer symbolize that the end is near to a long, emotional journey that you have taken. Even though you have no idea where the road is going, reindeer tell us that we have what it takes to keep going, and to have courage to move forward. This, indeed, is the theme of December: courage. As we draw near the end of 2015, a year that has been about major expansion and “blind” movement, we will be given the ultimate opportunity to apply what we have learned this month about faith and trust. December is helping us embrace our fortitude and our fearlessness. After everything we have been through, both personally and globally, there is no sense in giving up now! There is not much written information about Machidiel. He rules the sign of Aries, and is the Archangel of the month of March. So, why does he come to us now during December? Well, I have learned that Archangel Machidiel is the Archangel of Courage! He gives us strength and lights our way through our own hearts. I am so pleased to have him here with us for this month’s message, as the most POWERFUL thing we can do this month is pay attention to the messages of our hearts and intuition. It no longer suits you to go against anything that makes you feel bad, uneasy, awkward, unhappy, uncomfortable or worried. The signals you receive through your emotions are so strong now that even your physical body feels horribly uncomfortable. For example, if a friend asks you to go somewhere, and you feel you don’t want to go and then decide to go anyways, you will feel so uncomfortable that you could possibly feel ill later on. There is no way to avoid this unless you stay true to what you want in the moment. Trust your inner messages, and don’t worry about upsetting anyone; if you follow the actions of your highest good, then everyone will benefit from those actions. You have expanded so much that you can no longer go against your own current. Therefore, this month is a time to listen to the messages of your Divine Self. It can be a stressful time of year for those who celebrate any of the numerous holidays that take place, so it is essential you become comfortable with saying ‘no’ to others and ‘yes’ to your ideal feelings. Say ‘yes’ to feeling joy, peace, gratitude and love. Follow your instincts, and trust in yourself. Archangel Machidiel encourages to “do” or “not do” whatever feels right to us. In short, it is important to be ourselves without worry or preoccupation. When he came to me, I saw a very light blue and green aura, almost like aqua, and some cream color. This angel has a lot of feminine qualities that help us be in tune to our inner guidance. He put a brilliant light onto my heart chakra, that made me feel unashamed to be who I am, who I have been, or who I will be. He helps you take self-judgement out of the picture, which clears the way for loving thoughts. You might not see a lot of action this month, but that is because you are building up your strength and courage through “small” movements; so, when you WILL have many things to do in the near future, you will not experience a lack of confidence, because you will have a strong foundation to base your trust on! Al always, the best thing you can do is pay attention to what you want or need in the moment, without projecting too far into the future. Random knowledge: he also showed me how he helped Marie Curie follow her own passions and inner guidance (despite anything society said, and without worrying about what others would think) so she could become a renowned female physicist. Greetings beloved souls, light bearers, light givers, and sparks of the universe. I am Archangel Machidiel, here to spark within you the passionate fires of your heart. You may feel directionless this month; know that there is much value in not doing just as much as there is in doing. Your qualities of listening and being still will greatly fortune you this month. This month is good to keep quiet, to focus on the essence of your desires, and to follow your guidance as you see fit. I will ignite your hearts with passion and courage whenever you call on me. I do not push you forward, but instead help you realize your endless strength in order to move yourself forward. I am here to guide you, and sometimes that means keeping still. You could easily fall into worry this month, especially when it comes to money. You will indeed have everything you need, so turn your focus on gratitude. Do you realize the power of gratitude? It is to put you in a state of high vibration. It is to help your conscious mind recognize all the love you are surrounded with. Gratitude is an extension of giving love, so giving gratitude will surround you with the vibration of love. It surrounds you with the vibration of joy, so that you can readily receive the gifts of the universe that you yourself have created. I cannot express how powerful you are. Your inner desires are reflected all around you in your physical reality; so, always ask, and you may be specific in what you ask for. Then let go of expectations. You may ask to see growth, and see a tree that is growing. Be specific in what you want, and not how it should happen. If you want to see yourself as growing and successful, ask for this, and let it unfold before you without trying to control every step. If you must take actions this month, focus on each moment as an opportunity to follow your inner guidance. One step at a time this month. You can trust yourself to do what is right for you. You can be courageous this month when it comes to taking chances; do and say things you’ve never done before, or think thoughts you’ve never allowed yourself to think. I express all my love for you in each moment; call on me to feel it, so you can feel your own love that you have for yourself, and all of your kind, as you are all one, and never alone. If you feel anything this month, feel the courage within you to simply be WHO YOU ARE. Be who you are, be true to yourself, be true to your guidance, be loving to yourself. This does indeed take a lot of courage, as you have become accustomed to denying yourself everything you feel, everything you are, and everything you want. If you can stay true to yourself moment to moment, you will feel much joy more than you ever have before. You are READY to be you. I am with you, loving you and igniting you. I wish you all the best this month, as you access the courage that is always with you. Keep moving forward by being who you are in every moment, and you will feel more joy and strength possible than ever before. There are so many holidays being celebrated this time of year that bring us closer together. I am running a special that gives you a free one-question reading! If you feel guided to do so, check it out! This offer will run through January 5th, 2016! Holidays can also be stressful, so let us all make the intention to be stress-free this season. Intend to listen to your emotions and pay attention to the signals they give you. Are they telling you to remove yourself from a situation? Do they inform you whether to make a decision, or to wait? Remember your emotions are like a barometer to help guide you towards joy and fun. If you feel unhappy, ask your intuition for a clear answer about what you can do to be more joyful. Listen for the first idea that pops into your head, and don’t question or rationalize the idea. Just go with it, and apply that idea in the moment as best you can! This week we get grounded as the full moon comes out! This week is for emotional healing and recovery. You’re encouraged to express yourself, without ego-based goals of getting others to listen to you. Your throat chakra is important this week, so magnify its energy with expressive activities. This week is focused on letting go of guilt, and embracing love and confidence, without the judgement of others dictating how you feel. The messages that come through are very gentle. We are asked to focus on HOW do we want to feel? What is our inner guidance? Know that all steps you take are giant leaps forward, and you can have faith and trust in yourself. You, as all in this world, are being watched over and guided. This week focuses on healing doubts and fears of all kinds; we will be moving more into alignment with our higher selves, and given opportunities to do so in a physical way this week. Have faith in your journey, and see yourself as you truly are: a vibration of loving energy. It’s taken me awhile (over a year) to start writing psychic lessons again. I’ve learned that I lose inspiration when I overwork myself, or keep myself TOO busy. Seems so simple a concept: just slow things down a little! Yet it is something I so easily forget. I am excited to be back into it, and to keep creating free services for you all. 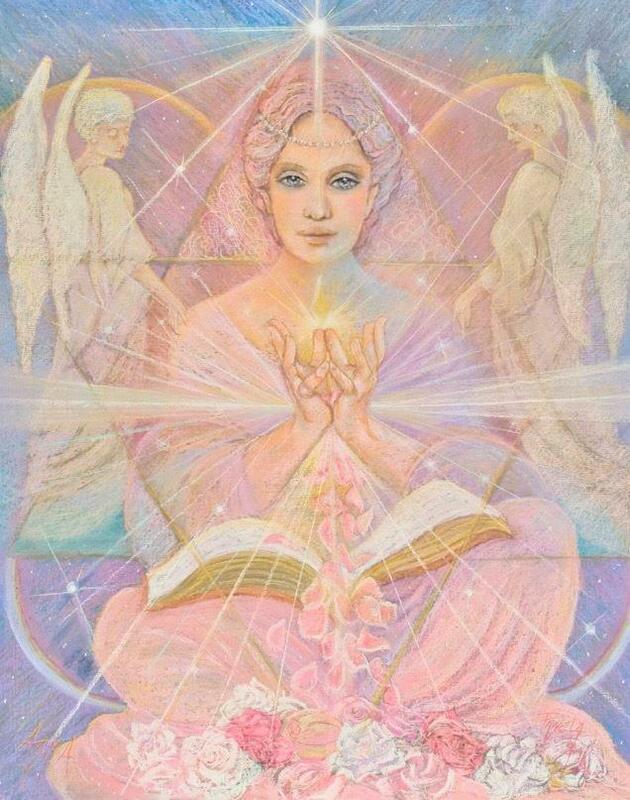 I desire anyone who is ready and willing to find a way to be in touch with their spirituality; I find it truly empowering for you to be connected to your soul-self. For me, it is all about living a life of joy and ease. This lesson includes a meditation to open up your psychic senses. Find it on the Psychic Me page, which includes free PDF’s for you to download. Lesson Four will be about reading and interpreting the energy you receive, before we move onto meeting your spirit guides and angels! These next two lessons will be out in time for the end of the year. Love and Blessings to you all! I spent my Sunday roaming wooded areas by the Mississpi River for about 5 hours. It was a beautiful autumn day full of sunshine, and I felt very at peace as I walked and meditated, having conversations with my “spiritual sidekicks” and looking within. I was really tuned into the “helplessness” that many are feeling, and since I am never without a deck of cards, I decided to do a reading in the woods! I wanted to know what would help us get back into empowerment when we are feeling down? This reading provides an affirmation for us about getting into good vibrations and being tuned into our emotions. Your emotions are your roadmap for where you are spiritually. They can tell you when you are in good vibrations, or out of alignment. It’s like trying to tune into a radio station; you are in static, the wrong station, or in your intended station. The last one is the best, and that is when you feel joy, because when you are in alignment it is impossible to feel anything BUT joy. The signals are clear, and your intuition is strong. So, let’s work on “being in our station”, and be open to receiving good vibes. Pay attention to your emotions; they tell you what station you are at, and whether you need to adjust the frequency. This week might feel like a standstill; the gift this week is your ability to “ride the current”, which means following your urges and intuitive messages. You might be unsure of next steps to take, as you are not seeing immediate tangible manifestation. The message here is that there is working happening for you in the ‘unknown’, or rather the ‘unseen.’ You can truly feel things shifting your way if you trust in yourself, and embrace your self love; the ‘seeing’ will come in one way or another as time goes by. Remember you are not aiming to gain things, but rather the essence of what you desire. Lots of transition happens this week, with an emphasis on positivity and healing. The beginning of the week asks you to tune into your inner guidance and messages, and let yourself do things in a new way. The middle of the week shows learning and motivation, while letting go of old habits so you can work on your manifesting abilities. The weekend is about carving out your own path, and paying attention to all the available resources around you. A very powerful week with lots of positive things that all come from your own abilities!